Raymond P. Lefker, Chief Boilerman Technician, born Dec. 19, 1916, Cincinnati, OH; completed high school; and enlisted in the USN on Sept. 19, 1935. After boot training he was assigned to the battleship USS West Virginia. In September 1941 he was transferred to the USS Oglala flag ship of the mine force at Pearl Harbor where it was sunk. After the attack he was assigned to burial detail and security patrol along Pearl Harbor water front. During the war he also served on destroyers and escorted convoys during the North African Campaign. He spent the last war years in the Pacific, screening carriers from kamikaze attacks and ended up in Tokyo Bay on surrender day. Memorable experiences include riding out a typhoon on board the USS Goss (DE-444) during the Okinawa campaign; the Pearl Harbor attack on December 7; and the surrender in Tokyo Bay. 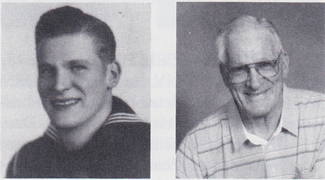 He retired from the USN July 18, 1958; then worked in Federal Civil Service until he retired in January 1972 as a naval inspector of mechanical systems, supervisor of ship repair and alterations in San Diego, CA. He received all the usual medals issued during the Pacific and North African Campaign. Married Crissy and has two children, three grandchildren and three great-grandchildren. He enjoys traveling in his motor home, fishing and boating.